Rosette Pak Choi, Spoon Mustard. Known as "Tah Tsai" in China, Tatsoi or Rosette Pak Choi is among the most popular of oriental greens. Tatsoi is a non-hearting oriental mustard with spoon shaped, dark green leaves which are not only full of flavour, but very tender. The spoon-shaped, dark green, evenly spaced leaves form a plant worthy to be grown for its decorative value, given enough room and cool conditions the plants will form beautiful wide rosettes, of regular, concentric circles. Tatsoi is suitable for both baby leaf and whole head production, it can be harvested anytime during growth, young leaves are especially delicious with a mild mustard flavour and good crunchy texture. It has a wide variety of culinary uses that range from using the leaves raw in salad mixes, in soups and in Oriental stir-fry. They have a more robust flavour which many consider to be superior to Bok Choy. Tatsoi matures from seed in only 45 to 50 days and is able to withstand temperatures as low as -10°C (15°F). It will often continue to grow throughout winter, and can even be harvested from beneath snow, making it one of the best vegetables to grow in a cool climate. Oriental brassicas or Chinese greens really deserve their place in any kitchen garden providing a fantastic winter to spring food source. Tatsoi prefers rich, moist, well drained soil with lots of organic matter. This hardy vegetable does particularly well in winter in an unheated polytunnel. This seed is organically produced (seed harvested from plants that have themselves been raised organically, without the use of chemicals). Sow from Spring through to Autumn. Sow directly outdoors into finely raked, moist, weed free soil. Sow seeds successionally every 2 to 3 weeks in spring as early as the soil can be worked. Sow in late summer for autumn and early winter harvest. For autumn sowings, (late August to early October) sow under the protection of glass/tunnels. Phasing the sowing will extend the cropping period. Space the initial planting very densely, then harvest entire plants, leaving the strongest to grow to maturity at about 25cm (12in) spacing. Sow seeds thinly at a depth of 1cm (¼ to ½ inch). For mature plants, sow 15cm (6in) apart with 45cm (18in) between the rows. For use as stir fry sow in 15 to 30cm blocks. Sow very close together for baby leaf. Tatsoi needs a rich soil and plenty of moisture all through the growing season. Although they do better in cool weather, Tatsoi together with Mizuna are the last ones to bolt when the hot weather hits. Tatsoi can be harvested at almost any stage of its growth. 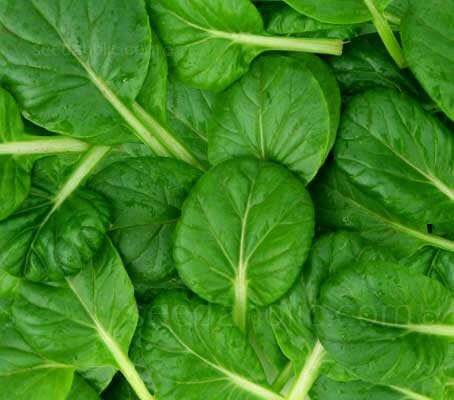 If large leaves are not important, just flavour, you can grow the plant to the baby stage (4 to 6 leaves) and harvest the entire plant at about 3 to 4 weeks. As the weather starts to warm in spring the leaves tend to grow upright. If Tatsoi is to be harvested on a cut and come again basis, use the largest leaves on the outside and leave the smaller ones towards the centre to develop further. It can then be left to grow again for a second or more harvest. Tatsoi grows more slowly than other oriental brassicas. It is a good idea to give the plants a good drink of water and/or liquid fertilizer after each picking. Tatsoi is best stored in a plastic bag in the crisper drawer of the fridge. It should hold for around a week.